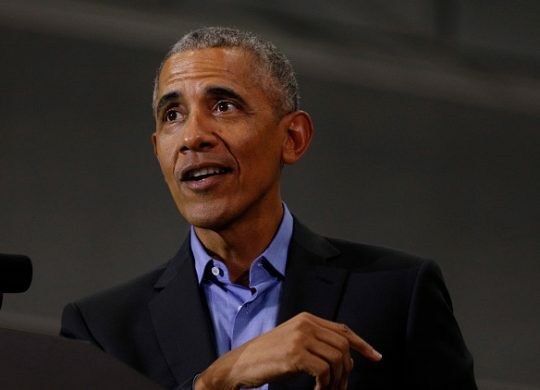 Former President Barack Obama said on Tuesday that identity politics originated with the Founding Fathers and charged that the United States suffered from "great smugness" after the Cold War. On a stage with former Secretary of State James Baker at Rice University in Houston, Obama noted the failure of the country to properly adapt to the rapid economic changes brought about by globalization and how he felt that brought on the nationalist politics of the Donald Trump era. Blue-collar voters in the Rust Belt in states like Wisconsin, Michigan, Ohio, and Pennsylvania helped flip states in 2016 that voted for Obama twice to Trump, who focused much of his campaign on workers who were "left behind." "In those environments, you then start getting a different kind of politics … that's based on, ‘that person's not like me and it must be their fault,' and you start getting a politics based on a nationalism that's not pride in country but hatred for somebody on the other side of the border. And you start getting the kind of politics that does not allow for compromise, because it's based on passions and emotions," Obama said. "It's identity politics," Baker said. "Which is why, by the way, when I hear people say they don't like identity politics, I think it's important to remember that identity politics doesn't just apply when it's black people or gay people or women," Obama said. "The folks who really originated identity politics were the folks who said Three-Fifths Clause and all that stuff. That was identity politics … Jim Crow was identity politics. That's where it started." The Three-Fifths compromise refers to agreement at the 1787 Constitutional Convention, where state delegates reached a deal that slave states would count three people in their populations for every five slaves they had. That in turn affected how many representatives slave states would have in Congress. "So part of what's happened is that when people feel their status is being jostled and threatened, they react," Obama went on. "What I would agree with is that the Washington consensus, whatever you want to call it, got a little too comfortable … they're only looking at GDP numbers and they're looking at the Internet, and everything's looking pretty great, particularly after the Cold War. After what you guys engineered, you had this period of great smugness on the part of America and American elites, thinking we got this all figured out." This entry was posted in Politics and tagged 2016 Election, Barack Obama, Constitution. Bookmark the permalink.